It’s been, as the Grateful Dead famously said, “a long, strange trip,” but in the end, a judge declared Ginger (aka Gingeroo The Wonder Pup) a permanent part of our pack. During the last few months, we’ve been tested, friendships have been tested (and passed with flying colors), and little Gingeroo has grown (she’s now more than doubled from her original 10 pounds). People have asked if we have lost faith in pet rescues as a result of our experience. The short answer is… no. The long answer is a long one indeed, so I’ll give the medium-length one: There are many responsible rescue organizations trying to do their best for both animals and the people who want to adopt them. They work long hours, usually as volunteers, endure heartbreak, all to save lives. We’ve gotten to know some of these people and they truly care. Yes, sometimes they ask a lot of very personal questions, because they’ve seen dogs, cats, horses, etc. come back. They see up close what can happen when the pet and the adopter aren’t good fits. Yes, sometimes they take too long to get back to you. Yes, there are some who shouldn’t be involved in rescue at all… we’ve met those, too. But generally, most of the people in rescue we’ve gotten to know are responsible, reasonable people trying to do something very difficult for the best reasons. I can’t even regret our experience with not one, but two, irresponsible rescues. In the end, we got Gingeroo. It’s been expensive, frustrating, scary, stressful, exhausting… pull out your thesaurus and find a word for “awful” and you’re on the right track. But now she’s ours, our affectionate little spitfire. So if you work with a rescue, or you’ve dealt with one… how do you recognize a reputable rescue group? What should someone be looking for? I’m hoping to spare someone else the experience we had. Thanks for your input! 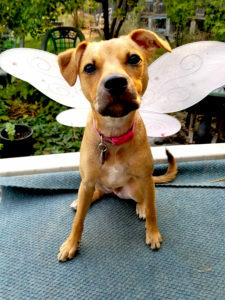 Gingeroo isn’t sure if she’s a fairy or an angel, but she knows she can fly! This entry was posted in Dogs and tagged #adoptdontshop, #doglife, #dogs, #Gingeroo, #puppies, #puppy, #rescue, #rescuedrama, #teamginger, dog, IdeaJones. Bookmark the permalink. Signs to look for … is the dog vetted by a vet and do they have records of it… do they have a contract for every person that dog goes with (foster contract, adoption contract etc) … is the dog wormed, treated with flea treatment, microchipped before you get it? Does the rescues’ posts talk about happy endings and happy stories … are a lot of dogs without endings? No updates? Do they always ask for money? Do you see a lot of “I” “me” – look what I do for these dogs … are they professional and honest … do they truly care about the dog? Cuz it should BE about the dog!!! Thanks, Terisa! I’m going to work up an article about what to look for, and look out for, when dealing with a rescue. Unfortunately, bad apples give the idea of rescue a bad reputation for many people. I’ve heard from some who say they won’t consider adopting from a rescue because of the things they’ve heard. That really makes me sad because responsible rescues perform a critical service and save so many lives! But you have to know what to look out for. Thanks for giving me some info to start with!